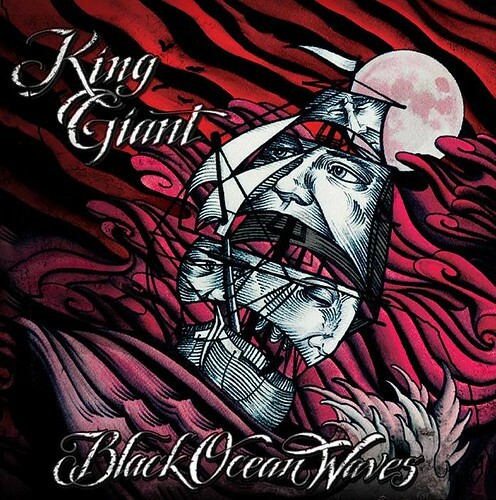 Yesterday locals King Giant released their third album, Black Ocean Waves, which you may have heard previewed at our Metal Night at Fair Winds Brewing back in early May. DCHM writer Buzzo Jr got his hands on an advance copy of the album and below is his take on it. Be sure to check out a couple of the songs on the album at the bottom of the post too! Like their DC counterparts Borracho, King Giant’s sound is deeply rooted in the blues, and boasts tons of great guitar work. Todd Ingram (also of Sixty Watt Shaman) and David Kowalski make an excellent team here, with their guitars churning out heavy riffs filled with that southern groove, and vibrant solos that compliment the darker parts of the album’s sound. Todd and David often change the pace of their playing on the record, going from mid paced stomps on “Red Skies” and “Blood of the Lamb” to faster paced gallops like on the song “Trail of Thorns.” The basslines are unfortunately lacking in effect, often being just barely audible over the rest of the band. This is kind of disappointing, seeing as one of the reasons I love stoner metal is how much the bands utilize the bass guitar. The drums make up for this however, with Keith Brooks laying down beats that are somehow laid back and energetic at the same time. While relatively simple, the drumming on the album works well by adding to the swampy atmosphere of the record. The part of this album that stands out the most here are the vocals. Dave Hammerly’s vocal style has been compared to Glenn Danzig’s style of singing and while the resemblance is undeniable, Dave manages to make the style his own. With his brash, bellowing shouts, and his deep drawls, he brings the record to life by encapsulating the sounds of the filthy south, perfectly meshing with the rest of the elements on the album. Like most music based in the blues, Black Ocean Waves is filled with emotion. Each track has its own tale, whether it be anger and lament towards past addictions on “Requiem for a Drunkard,” perilous journeys at sea on “Red Skies,” or mournful farewells to loved ones on “There Were Bells.” The album’s overall mood is far more melancholy than your standard stoner rock release, but that’s also what makes this album stand out among every other stoner album that’s been released this year. The brilliant mix of catchiness and grit culminates in a fantastic album that is one part Black Sabbath with its doomy riffs, and one part Lynyrd Skynyrd with its melodic twin guitar lines. A standout track for me on this album was one of the album’s most aggressive songs; “The One that God forgot to Save.” The track showcases some of the best drumming on the album, and Hammerly at his most intense; belting out lyrics like a madman. King Giant don’t reinvent the wheel with Black Ocean Waves but they do bring forth a great record comprised of heavy riffs, soul, and attitude. If you like loud stoner rock with a southern twinge, don’t miss out on this record.